Dr. Carlos de la Guardia is an academic as well as a practitioner in Brand communications. From the academic perspective, he obtained his PhD at the Faculty of Communications Sciences at the Universidad Autónoma de Barcelona, Spain. His research PhD paper was on applying strategic planning of brand communications to employees’ communications. Before that, he was awarded his Diploma in Advanced Management Program at IESE, Spain. He was awarded his Master Degree in Marketing at IE, Spain. He studied and got his diploma in Advanced Political Studies from the College d´Europe in Belgium and his BA in Philosophy and History at Trent University in Canada. On the practitioner’s side, he is a strategy planner of Brand communications and he has worked for the largest advertising networks. His last post was as a Global Director of Strat Planning for Danone Waters WW through YBR. He has also worked for Seat, Danone, Diageo, Virgin, Gallina Blanca, in most cases as an implant. From early in his career he has had management responsibilities, he has been part of very large and successful campaigns and has directed important brand projects. Also, he is a consulter on brand communications and his specialty is Internal Branding, a field in which he has designed and led several projects for Universidad Internacional de Cataluña, the Diputación de Barcelona and for Danone Worldwide, among others. He has pursued a long teaching career as well. He is a professor at Esic at undergraduate and postgraduate levels and he has held professorships at universities and business schools such as UAB, UIC, UPC, ESADE, EUNCET. 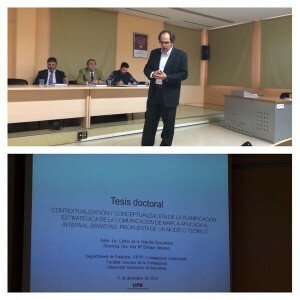 Esta entrada fue publicada en About Carlos de la Guardia, Carlos de la Guardia, English, Internal Branding, Language - Idioma el 29/12/2014 por Carlos de la Guardia, PhD.